The ladies of the Gamma Rho Omega chapter of Alpha Kappa Alpha (AKA) Sorority Inc. came together for their inaugural International Day of Prayer Observance on Sunday, August 26th at St. Paul AME. The goal of the Day of Prayer service was to expresses the sorority’s concerns for the challenges facing families and individuals throughout the city, state and country. The program was also an opportunity for members to reinforce their dedication to community service and convey the importance of faith through prayer as a key solution to addressing important issues. African Methodist Episcopal (AME) Elder Elizabeth Yates, member of the Gamma Rho Omega chapter, was the service speaker. Titled, “What a Word This Is!,” several attendees commented on the strength and appropriateness of the message. 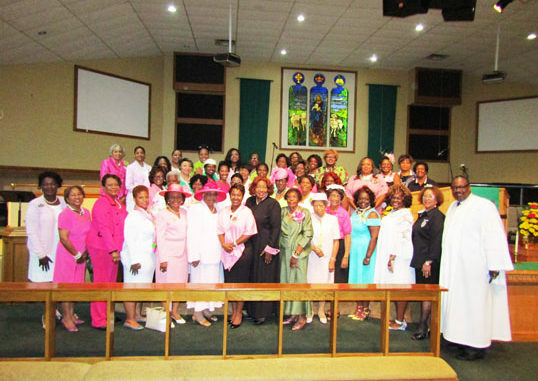 The Gamma Rho Omega Chapter of Alpha Kappa Alpha Sorority Inc. is under the leadership of President Willetta Richie. Chapter leaders say that they stand in solidarity with community members and continues to pray for healing and peace for Jacksonville and the country. Sorority sisters stand united in the pulpit of St. Paul AME.